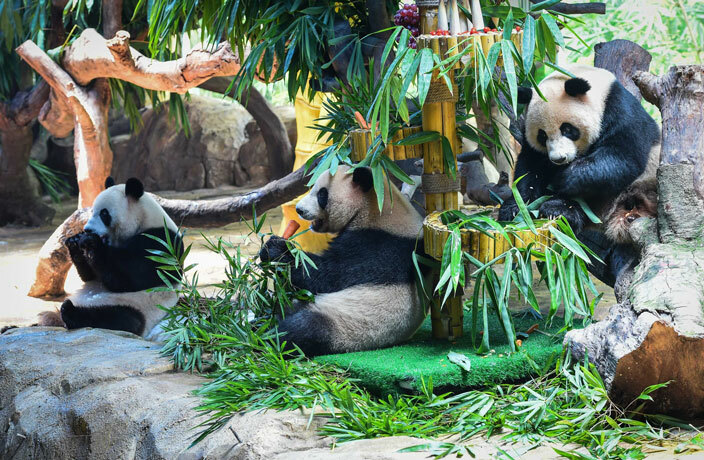 Mengmeng, Shuaishuai and Kuku – the world’s only known panda triplets – celebrated their fourth birthday on July 29 at Guangzhou’s Chimelong Safari Park. According to CGTN, hundreds of people gathered at the wildlife park to celebrate with the trio, including some human triplets. As a special treat, the panda siblings feasted on a ‘birthday cake’ made from apples, carrots, grapes and bamboo shoots. The lovable creatures were born blind, toothless and pink (that’s right – pink) back in 2014, and have since grown from 100 grams to 100 kilograms. In other panda news: last week, on July 25, Chimelong staff introduced media to Guangzhou’s only second-generation captive-born panda. The youngster is the offspring of Longlong, a giant panda who was born in South China five years ago, according to GRT Radio. With a mass of 130 grams, the baby panda has been described as a ‘fat boy’ in media reports. Families flock to paved mountain walks and more. Ride the metro to 4A tourist attraction Guangzhou Bangkok Park. Nickelodeon characters you know and love are coming to a city in Guangdong. The 75,000 square meter ski facility will bring year-round snowy fun to South China when it opens next year. What this little park lacks in roller coasters it makes up for in nostalgia-laden charm and surprisingly good ride selection. Damn it feels good to be a panda.